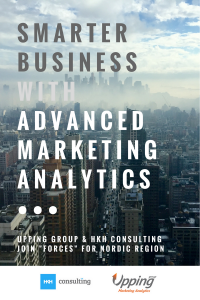 Analysis arkistot - OY HKH Management Consulting Ltd.
as a 110% service… Upping and HKH Consulting join ”forces” in delivering world-class Advanced Marketing Analytics What would be a better way to extend our data driven service portfolio than to offer advanced marketing analytics services? And to do this with world-class technology and providing clients with actual service, not technology to be handled alone…. Keep coming back for new interesting posts! OY HKH Management Consulting Ltd.
World Class Service. Flexibility. Cost Efficiency. Innovation. Creativity. 2 European hubs. Global network. World wide service independent of time and location.